If you’re just getting started with investing you may be wondering where to put your money. If you’re looking to invest in the stock market then you have three main choices: individual common stocks, mutual funds, or Exchange Traded Funds (ETFs). 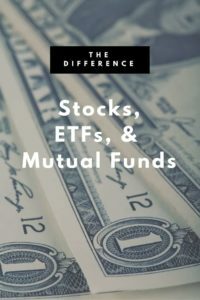 So, what are some of the differences between ETFs, stocks, and mutual funds? And which should you choose for your investment portfolio? How do “index funds” play into this since you probably hear that term tossed around a lot? 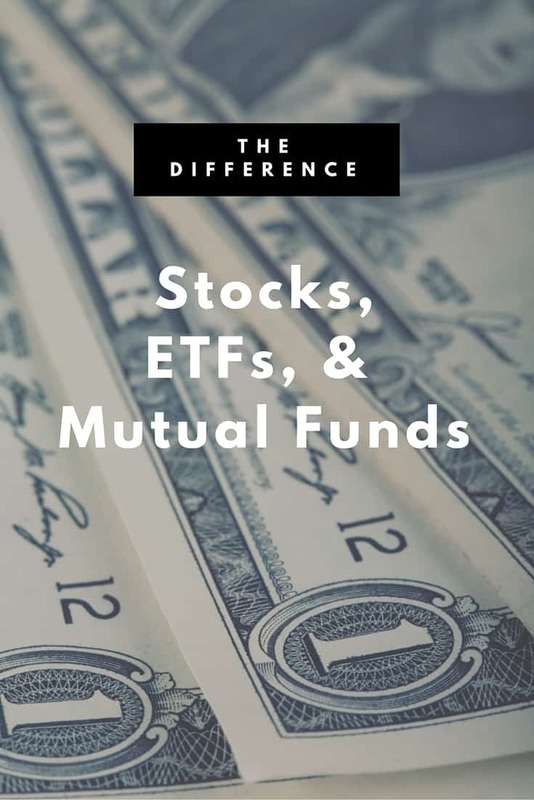 Let’s take a look at these three common investment vehicles and explore some of the difference between stocks, ETFs, and mutual funds. Common stock represents ownership interest in a publicly traded company. Buying individual common stock is the most obvious choice if you want immediate exposure to the stock market. Common stock is a concentrated investment….the opposite of diversified. Many investors start off with buying individual common stocks. They are easy to understand and most people are familiar with them. And they can be a good way to build wealth. If you are an active investor who enjoys research and portfolio management then there is no reason why you shouldn’t buy equity. But if you’re starting out, a mutual fund or ETF might be a better choice. Exxon Mobile is one example of a widely traded common stock. Stocks trade daily on stock exchanges and their prices fluctuate throughout the day. Individual stocks have no dollar minimums…so you can buy one share of stock at a time if you like. But you will likely need to pay your broker commission every time you trade individual stock, which can drive up your overall trading costs. Dividend Reinvestment Programs (DRIP) are one way to avoid paying trade commissions on common stock purchases. With DRIPs, you buy shares directly from the company itself, bypassing the brokerage firm. This will lower your trading costs. DRIPs are best suited for long-term investors who plan on holding their stocks for long periods of time. Individual stocks are riskier than ETFs or mutual funds. An individual stock can go to zero if the company goes under. Companies can and do go bankrupt and shareholders can lose it all. Remember Enron? But you are also much more likely to earn outsized returns with an individual stock over an ETF or mutual fund. Individual stocks have no management fees or expenses, so they are cheaper to own than mutual funds or ETFs. However, most brokerages charge commissions to buy and sell shares of stock. Check out our brokerage comparison tool to make sure you’re getting the lowest commissions. A professional investor runs an actively managed mutual fund, overseeing a basket of diversified securities. Mutual funds can hold stocks, bonds, or other investments. There are two types of mutual funds, actively managed and index mutual funds. Mutual funds are a more diversified investment when compared to individual stocks because they hold large quantities of stocks or other investments inside of them. Index mutual funds are slightly different from traditional, actively managed mutual funds. Index mutual funds passively track an index. Since they are not actively managed expense ratios are lower. The Vanguard Mid-cap Index fund is a good example of an index mutual fund. It holds a basket of mid-cap stocks. Mutual funds trade differently than stock. You can buy mutual funds through your broker, or directly from the fund. Some funds charge commission, others don’t. Mutual fund prices don’t fluctuate like stocks or ETFs, the net asset value is calculated just once at the end of each day. Some mutual funds have purchase minimums so they aren’t always good for small investors. Mutual funds are less risky than individual stock since they are diversified investments. But the potential for reward is lower with funds. Fees are a big drawback to actively managed mutual funds. If you choose to invest in these funds you will be paying for the managers salary…in addition to fees like the 12b-1 which go back to your broker. Fees are the main reason why index mutual funds or ETFs are usually better options. If you’re concerned about how much you might be paying in mutual fund fees, check out this free tool called FeeX which will scan your portfolio and tell you how much you’re losing to fees. Exchange trades funds are also diversified baskets of securities. They are similar to index mutual funds; they are passively managed investments. They simply seek to follow the performance of a benchmark. The iShares Core S&P 500 ETF is a typical index ETF, in this case a large-cap fund. ETFs trade like stocks. Their prices fluctuate throughout the day. You’ll pay your broker a commission every time you trade an ETF. Like stock, ETFs don’t have dollar minimums, you can buy just one share if you like. Like mutual funds, ETFs are less risky than stock. The chances of your ETF investment going to zero are low. But that doesn’t mean you can’t lose money. And like any investment in the stock market ETFs carry inherent risk and prices fluctuate. Since they are passively managed investments, ETFs usually have lower fees than mutual funds. Companies like Vanguard offer a variety of ETFs with very low expense ratios. For beginning investors, getting started can be overwhelming. There’s a lot to learn. But understanding the difference between stocks, ETFs, and mutual funds for investing in the stock markets is crucial to long-term investment success. And if you are willing to put in the time and effort, than you can quickly accumulate the knowledge you need. Want to learn more about investment basics? We’ve recently started a series on getting started with investing. Take a look and learn more if you haven’t already. This low cost course offers great value and can help you learn to navigate the investment world successfully. Mario Favela is a freelance content writer living in Austin, Texas. He blogs at Moving To Texas. You can also follow him on Twitter and Google+. You compared the three most used investment vehicles today in a very good and easy to understand way. I’m really fond of stocks even if it’s riskier than the other two, it can be really worth it in the end, for as long as you play the game of investing the right way. Great article. I am a huge proponent of people understanding their personal investments more and not just leaving it to a professional. I’m not saying we shouldn’t invest in Mutual Funds that are run by professionals, only that we should understand what they do and what the fund specializes in. It’s our future after all. Great easy-to-read article! For most investors getting started, the best type of stock to get into is a market index fund like SPY (tracks the S&P-500). Wonderful introduction and very useful for those of use with little to no investing experience. Although I own stocks, mutual funds and ETFs, I think beginning investors should invest in a very broadly diversified mutual fund first. You immediately get diversification and you limit any mistakes you can make.